Many birds have salt glands that function in removing excess salt from their bodies. These glands are typically located above the eyes, and the salty fluid they secrete is eliminated via the nostrils. As one might expect, seabirds have some of the best-developed salt glands among birds, given that they can't help ingesting large quantities of salt. However, well-developed salt glands can also be found in birds that are terrestrial carnivores, live in deserts, or forage for freshwater invertebrates. To accommodate their well-developed salt glands, these birds often have visible depressions in their skull. As such, the existence of well-developed salt glands in fossil birds can be inferred from the presence of such depressions. Until recently, these depressions had only been identified in Ichthyornis, Hesperornis, and Parahesperornis among Mesozoic dinosaurs. All three of these taxa were seagoing birds from the Late Cretaceous. A new paper, however, reports evidence of salt glands in Iteravis, a euornithine (i.e. : a closer relative of modern birds than enantiornithines were) from the Early Cretaceous of China. This represents the oldest clear evidence of salt glands in dinosaurs to date. 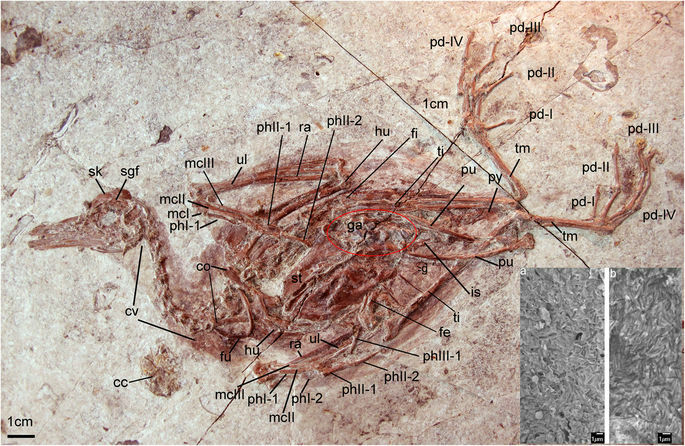 One of the specimens of Iteravis described in this paper, from Wang et al. (2018). Iteravis is known from many specimens (several of which are described in the new paper), all of them found at the same locality. Their fossils, however, formed in lakes (typical of similar Early Cretaceous deposits in China) rather than in the ocean. Why did Iteravis have well-developed salt glands? One possibility the authors raise is that the lake Iteravis was found in may have been meromictic, composed of several layers of water that did not intermix. Such lakes often have bottom waters that are much saltier than the water at the surface. It is worth noting though that none of the other birds from the same locality possess evidence of well-developed salt glands. The authors also point out that freshwater birds with large salt glands tend to feed on invertebrates, so it may have been that Iteravis did the same. Another possibility is that Iteravis migrated to the sea on a seasonal basis, which many modern waterbirds do. 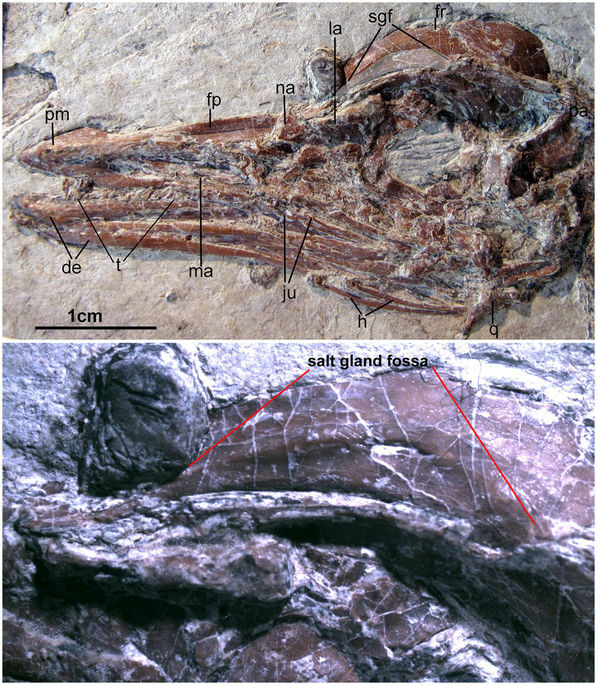 The skull of Iteravis, with a close-up highlighting the depressions that would have made space for salt glands, from Wang et al. (2018). My amateur restoration of Iteravis incorporating new information about its life appearance described by Wang et al. (2018), including black plumage and lobed toes. This paper is additionally notable in that it considers "Gansus" zheni (a euornithine found at the same locality) to be the same as Iteravis. In fact, the authors found that the holotype of "Gansus" zheni also preserves the same skull depressions for salt glands. The idea that the two taxa are synonymous was first suggested online by Mickey Mortimer, and has subsequently been supported by two recent books on fossil birds, but this is the first time that it has been put forth in peer-reviewed literature. Intriguingly, there is still no good evidence for well-developed salt glands in any non-euornithine dinosaurs, even those that likely had ecologies that would have benefited from such organs. The authors suggest that perhaps other dinosaurs were able to rely more on their kidneys for maintaining salt balance, or had salt glands situated in other parts of the body where they wouldn't have led to the evolution of the characteristic skull depressions. 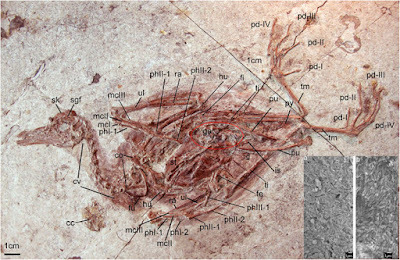 This is an interesting paper that both increases our understanding of a Mesozoic bird and raises thought-provoking questions about the evolution of other dinosaurs. 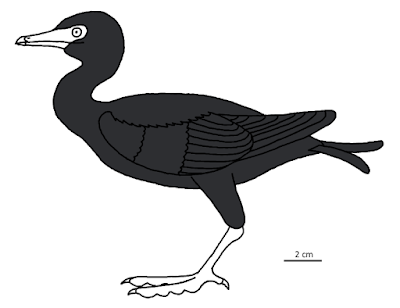 I was, however, a little surprised to see it repeating the obsolete interpretation that Hongshanornis was toothless.